Wednesday November 11th 1925 I rode to town with Ott this morning. He went for Mrs Mass to help care for the baby today. After dinner I rode over with the folks and got a gift for Edith Stevens who goes east tomorrow to be married soon. I went to the house and met a good many of the family there. Rode home with Ott and then we took Mrs Mass home. Letter from Warner McCall. He is not well. I am sorry. Thursday November 12th 1925 I was busy sewing in forenoon. Mrs Mass over for the day to help care for the baby. I went to town after dinner and sent box to Delavan. I was up in Clara Shultz office to talk about a place to rent. A drizzling rain with the streets very bad. Wrote Lydia in evening. 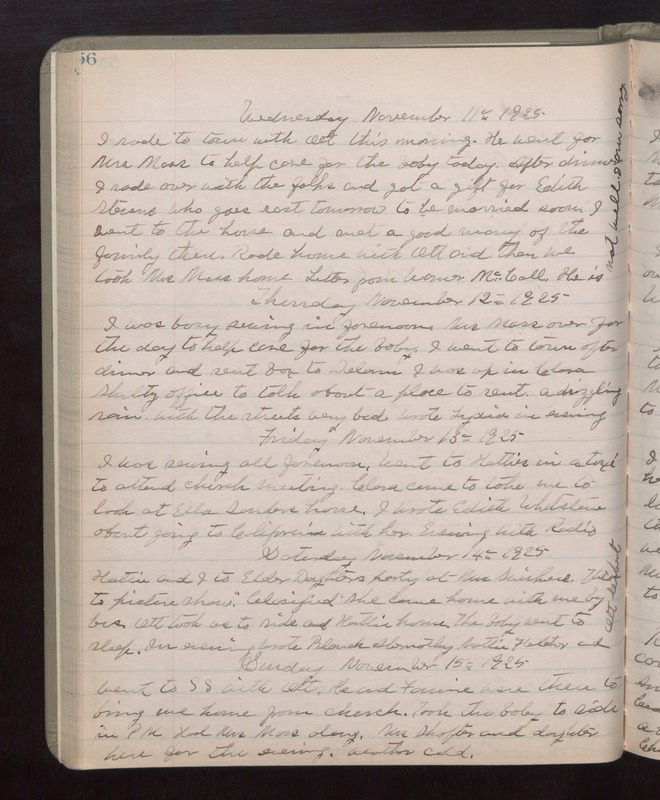 Friday November 13th 1925 I was sewing all forenoon. Went to Hatties in a taxi to attend church meeting. Clara came to take me to look at Ella Sanders house. I wrote Edith Whetstone about going to California with her. Evening with Radio. Saturday November 14th 1925 Hattie and I to Elder Daughters party at Mrs Swishers. Then to picture show "Clasified." She came home with me by bus. Ott took us to ride and Hattie home. The baby went to sleep. In evening wrote Blanch Abernathy, Mattie Fletcher and Ott Seibert. Sunday November 15th 1925 Went to S S with Ott. He and Fannie were there to bring me home from Church. Took the baby to ride in PM. Had Mrs Mass along. Mrs Shafter and daughter here for the evening. weather cold.